The Daily News was a British daily newspaper from London founded in 1846 by Charles Dickens. 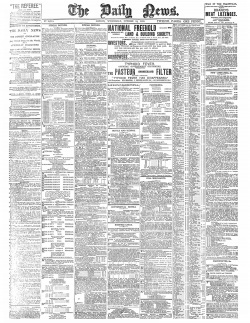 In 1870, the newspaper absorbed the Morning Star. In 1901, Quaker chocolate manufacturer George Cadbury bought The Daily News. In 1912, the News merged with the Morning Leader, and was for a time known as The Daily News and Leader. In 1928, it merged with The Westminster Gazette, and in 1930, with The Daily Chronicle to form the News Chronicle. Between 1899 and 1928, the newspaper published 15 letters, 2 articles, 1 poem written by Arthur Conan Doyle and 1 anecdote told by him. This page was last edited on 9 April 2017, at 12:31.